Serigraphy ( also known as screen-printing or silk screen) is a versatile printing process, based on the stencil principle. The method first appeared in China during the Song Dynasty (960–1279 AD), and gained popularity in 18th century Europe, thanks to imports of silk from the East. A group of WPA artists, who later formed the National Serigraphic Society, coined the word “serigraphy” in the 1930s in effort to differentiate the artistic application from the commercial printing application. Serigraphy was later made famous in the 1960s by Andy Warhol, who used the medium to achieve a bold, commercial look in his pop-icon prints. To make a serigraph, a fine woven fabric is tightly stretched and attached to a metal or sturdy wood frame. This forms the printing screen. A stencil is then created on the screen, by the application of a blockout. Artists have experimented with numerous blockout methods over time- including paper, hand-cut film, glue, photosensitive emulsion, and gelatin film. The blockout areas become the non-image areas. After the blockout is laid and dried, paper is placed below the screen and thick ink is squeezed into a line across the top of the screen. The ink is then dragged along the surface of the screen with a squeegee. This forces the ink to pass through the open area of the stencil onto the paper below. For multi-colored prints, a separate screen is required for each color. Below are several serigraph prints we have in our OPG inventory, by early 20th century and contemporary artists. Hope you enjoy! Trio. By Dorie Marder. 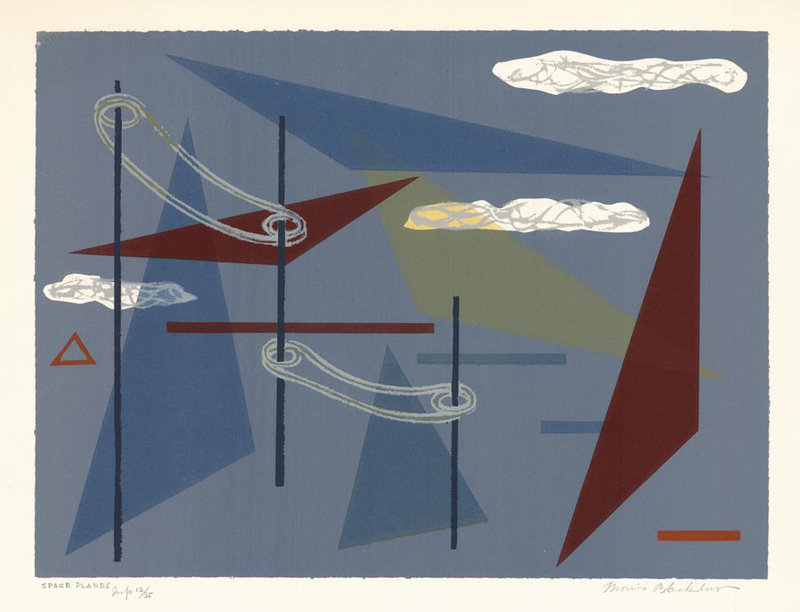 Serigraph, 1945. Image size 14 7/8 x 10 7/8″ (377 x 276 mm). Edition 45. LINK. Urban Views. (Large) #6B. By Patrick J. Anderson. 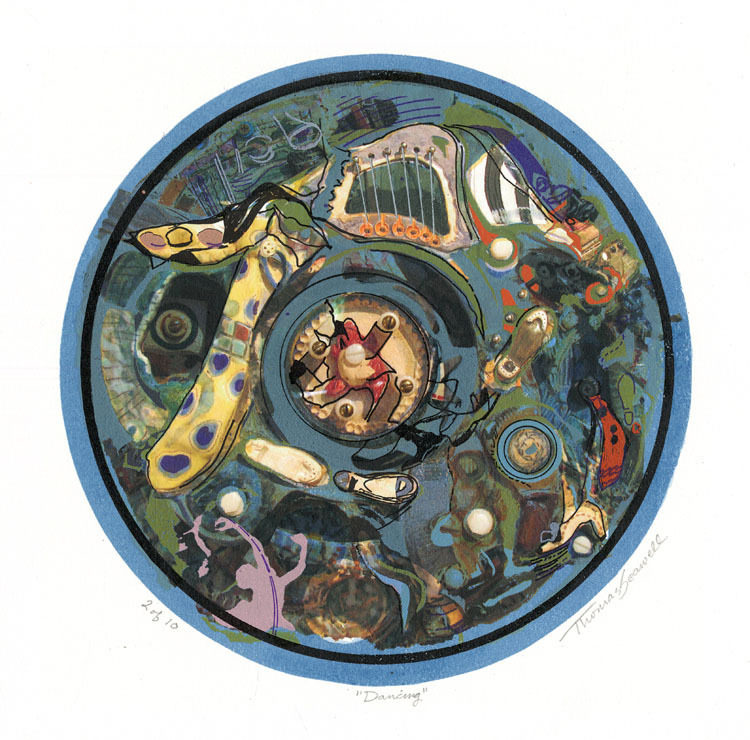 Serigraph, 2003. Image size 6 x 6″ (151 x 151 mm). Edition 12. LINK. Coastal Whimsey. By Joan Drew. Serigraph, 1965. 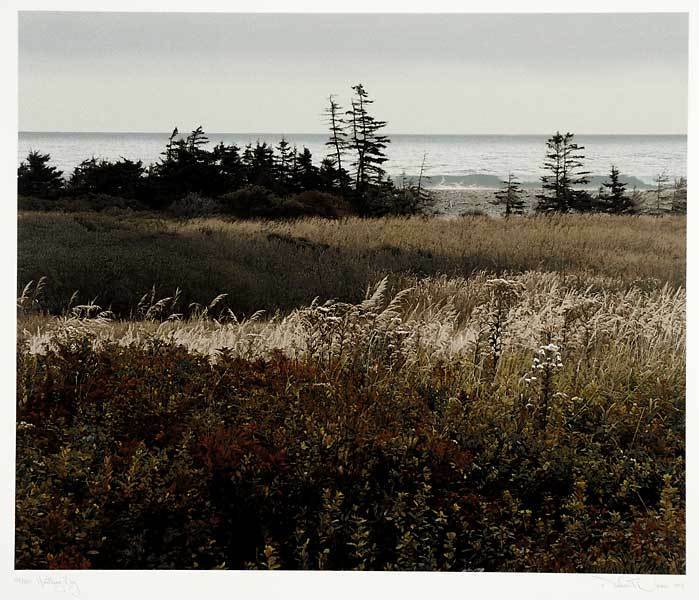 Image size 8 1/8 x 12 1/2″ (210 x 320 mm). Edition 55. LINK. Prairie Sunset. By Allan Simpson. 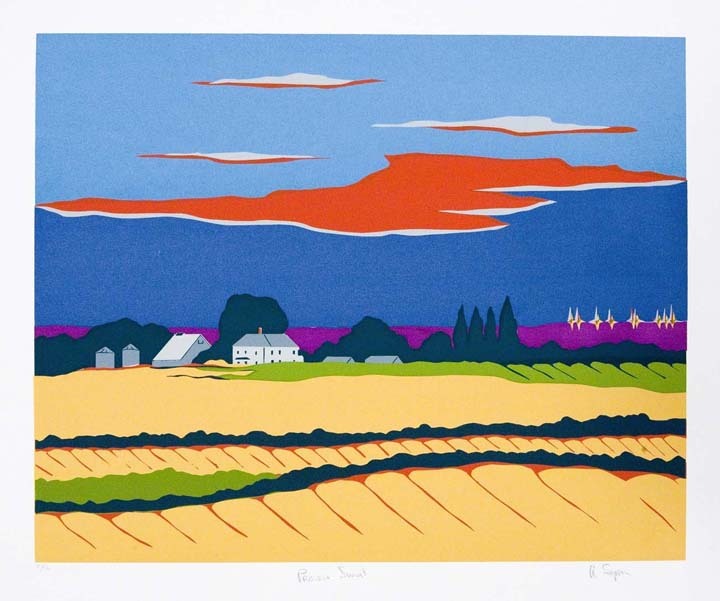 Serigraph, 1987. Image size 16 5/16 x 20 1/4″ (416 x 514 mm). Edition 30. LINK. Dancing. By Thomas Seawell. Serigraph and archival digital, 2010. Tondo – diameter 9 1/2 x 9 1/2″ (240 mm). Edition 10. LINK. Space Planes. By Morris A. Blackburn. Serigraph, c. 1950. 8 5/8 x 12″ (227 x 305 mm). LINK. Pet. 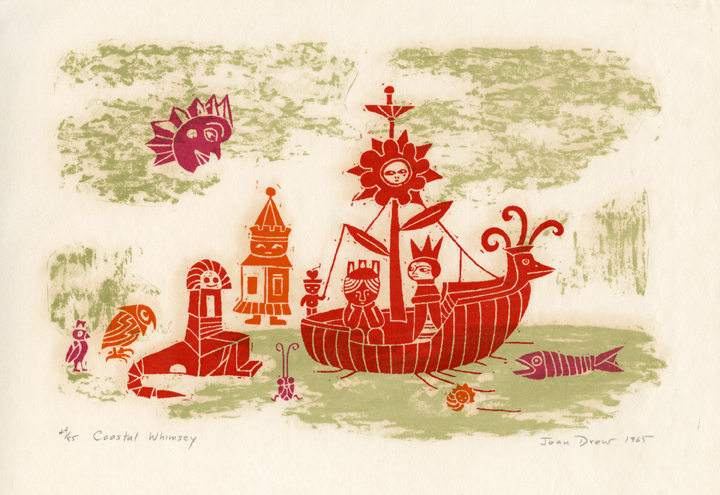 By Joan Drew. 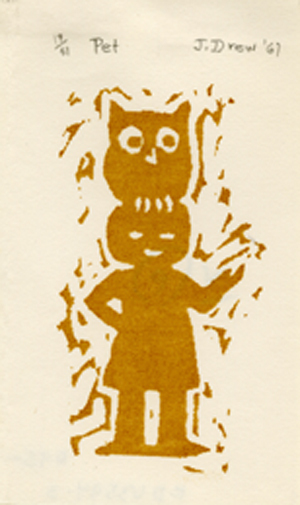 Serigraph, 1967. Image size 2 3/4 x 2″ (72 x 40 mm). Edition 51. LINK. Point Blank Distance. By Masaaki Noda. 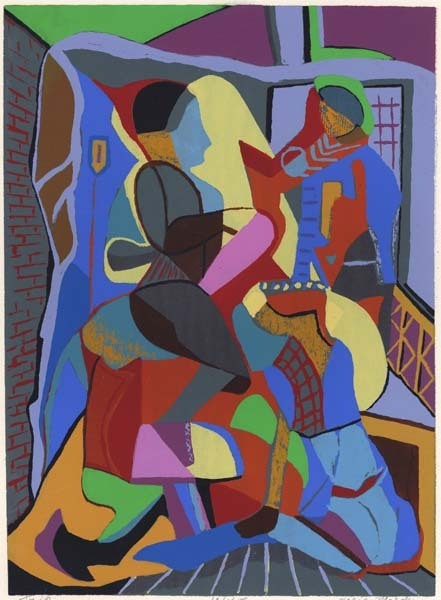 Serigraph, 1996. Image size 12 1/8 x 19 1/4″ (308 x 488 mm). Edition 40. LINK. Hartling Bay. By Richard T. Davis. 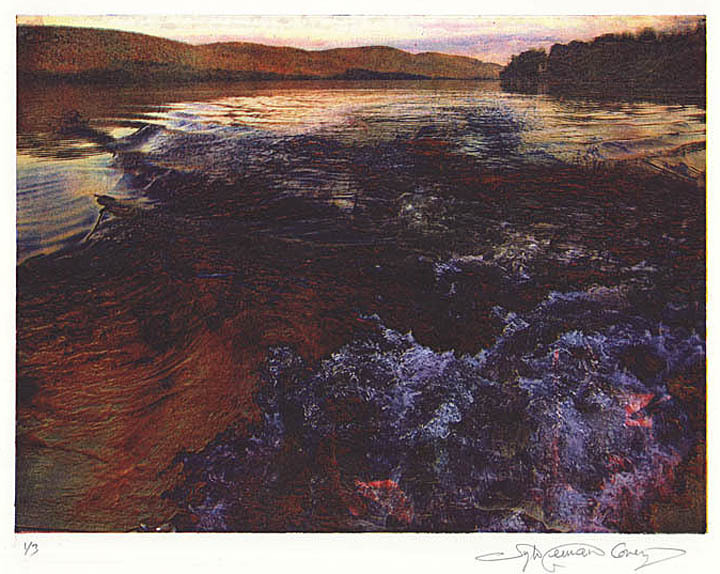 Color serigraph, 1993. Image size 17 3/4 x 20 1/4″ (445 x 509 mm). Edition 145. LINK. American Night / Neighbor & Orion II. By Herbert Simon. 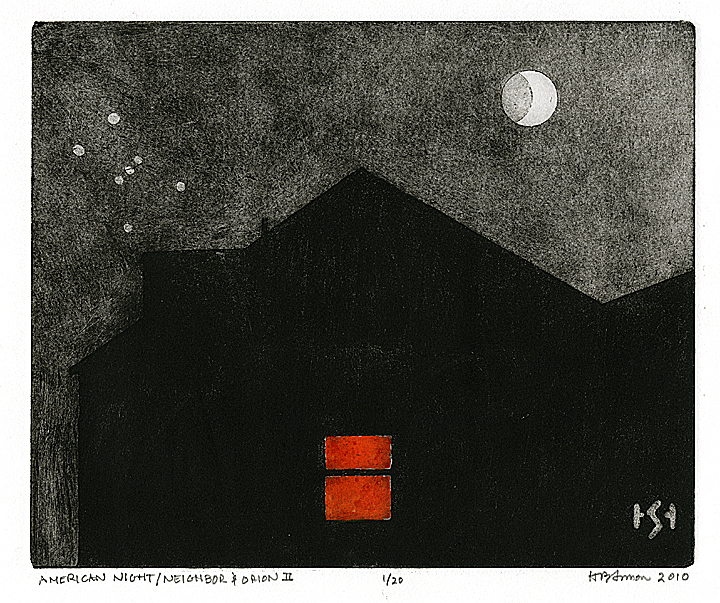 Etching, aquatint, and handcolored, 2010. Ed. 1/20. 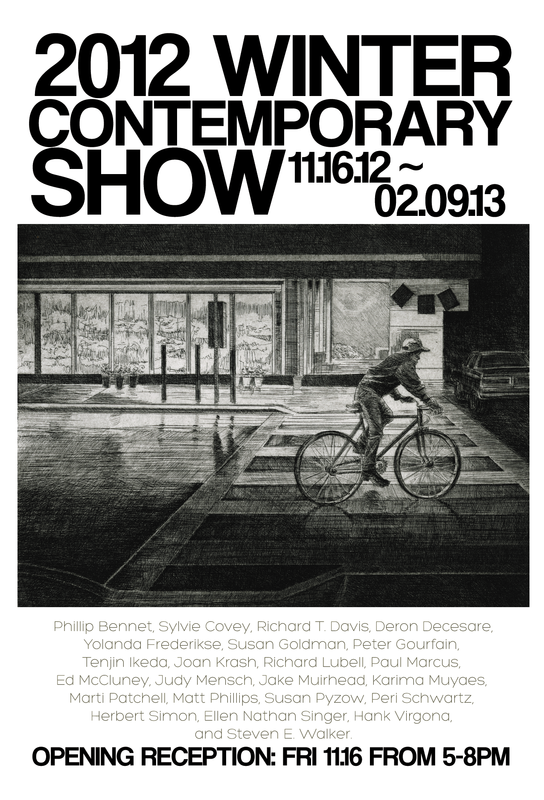 This past Friday, The Washington Post published a nice review of our Winter Contemporary Show in their Style section. It was written by staff writer Mark Jenkins, and featured in Galleries review, page C8, along with two other reviews of local DC exhibits. They even used an image of American Night/ Neighbor & Orion II by Herbert Simon, to accompany the article. We encourage our followers to read the review ( link right here) and then come see our Winter Contemporary Show. The group exhibit remains on view until February 9, 2013. To view the works in our show digitally, check out our website! And a big thanks to The Washington Post and writer Mark Jenkins for featuring our show and artists! Hartling Bay. By Richard T. Davis. 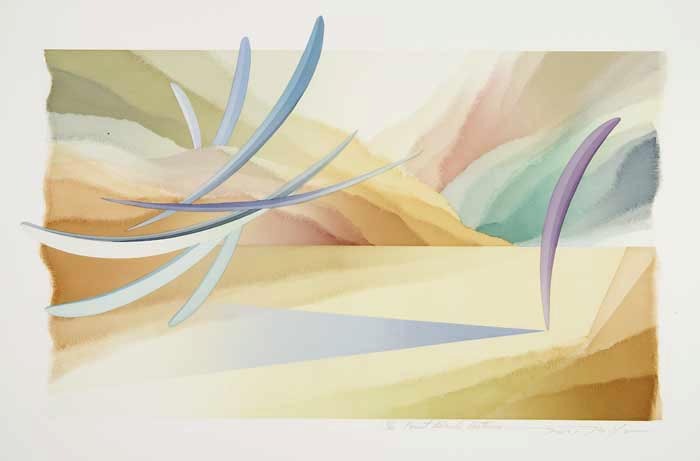 Color serigraph, 1993. Ed. 101/155. 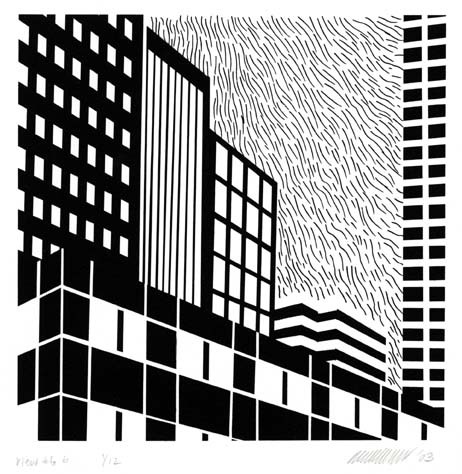 The Old Print Gallery is pleased to present its 2012 Winter Contemporary Show, which will open this Friday, November 16, 2012. 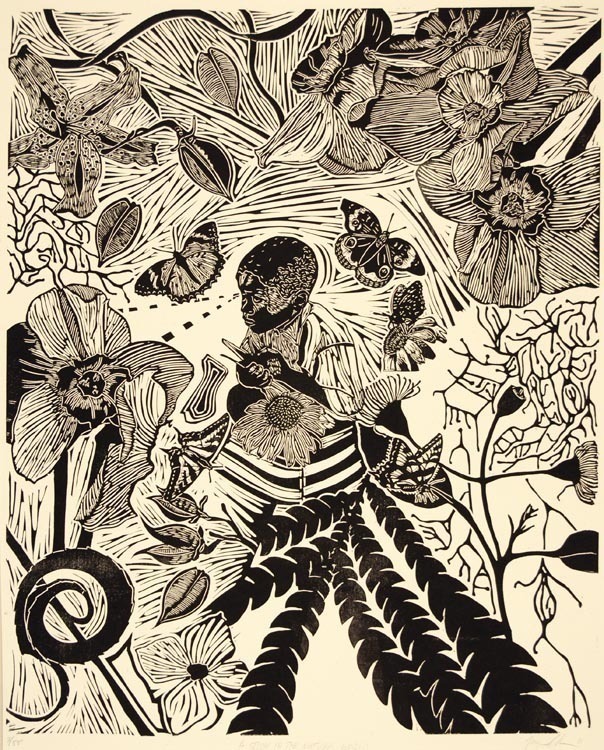 The show will be an assortment of works by both up-and-coming and established printmakers, in several mediums. Highlights include a series of charged photolithographic landscapes by Sylvie Covey, beautifully involved linocut relief prints by Karima Muyaes and Tenjin Ikeda, and boldly hued prints by local artists Susan Goldman, Philip Bennet, and Joan Krash. 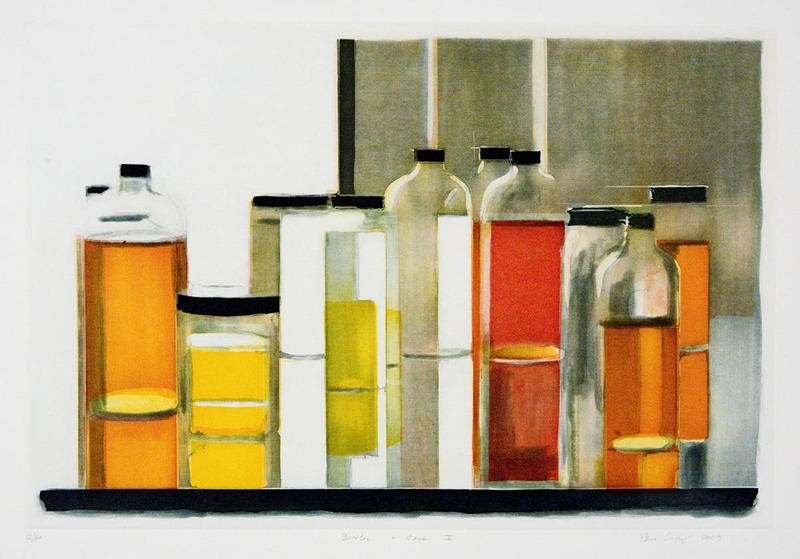 Bottles & Jars I by Peri Schwartz captures the crisp, luminous glow of the winter months and Neighbor & Orion II by Herbert Simon delivers a similarly poignant study of a hushed, nocturnal landscape, thanks to purposeful use of color. 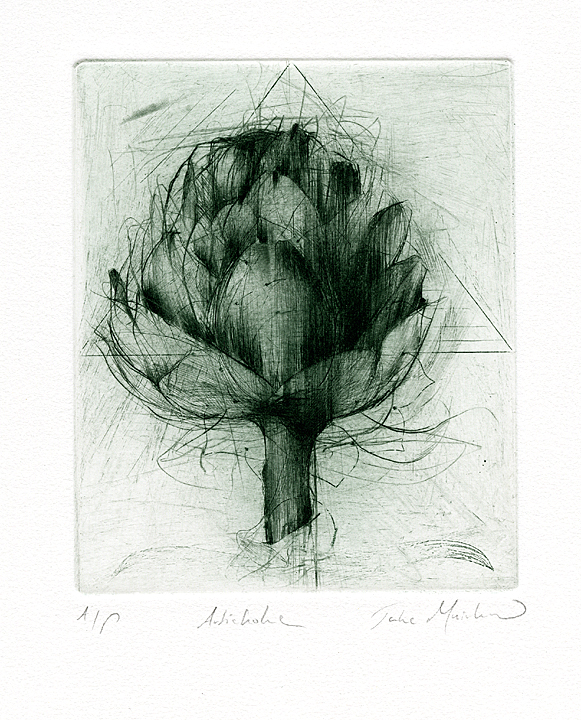 Local artists Jake Muirhead and Marti Patchell’s impressive draftsmanship result in intricate and delicate still lifes, elevating the familiar artichoke and cereus blossom in the process. Many of the artists in the 2012 Winter Contemporary Show are new to the Old Print Gallery, and offer a fresh approach to printmaking. The exhibit opens with a nighttime reception at the Old Print Gallery on Friday, November 16, from 5-8pm. Many of the artists will be in attendance for the opening, to answer questions regarding their work and artistic process. The opening reception is free and open to all ages. The show will remain on view until February 9, 2013. Selected Artists: Philip Bennet, Sylvie Covey, Richard T. Davis, Deron Decesare, Yolanda Frederikse, Susan Goldman, Peter Gourfain, Tenjin Ikeda, Joan Krash, Richard Lubell, Paul Marcus, Ed McCluney, Judy Mensch, Jake Muirhead, Karima Muyaes, Marti Patchell, Matt Phillips, Susan Pyzow, Peri Schwartz, Herbert Simon, Ellen Nathan Singer, Hank Virgona, and Steven E. Walker.